This page: Salt Creek, Teapot Dome Scandal. The Salt Creek Oil District remains one of the major oil fields of the United States, with its basin containing some 2.7 billion barrels of recoverable crude. As indicated on the previous page, the Salt Creek oil district dates back to the late 1880's, with the first major well being brought in in 1890. 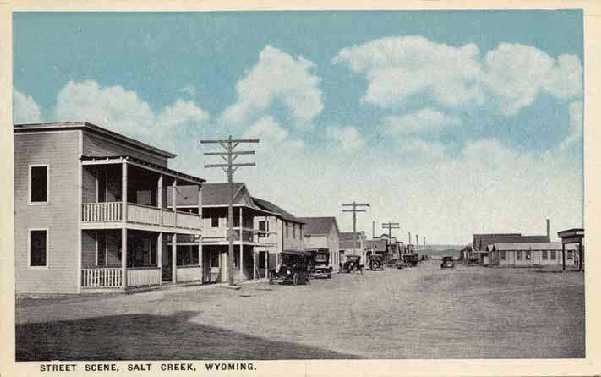 Salt Creek as a town, however, lasted only about four years from 1926 to 1930. 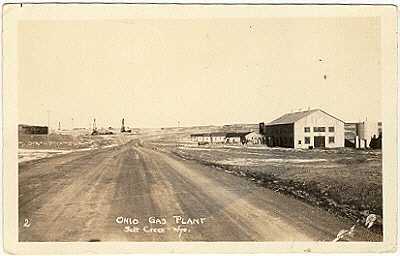 The Salt Creek Oil District became the center of a major scandal in the 1920's involving the Salt Creek Naval Oil Reserve No. 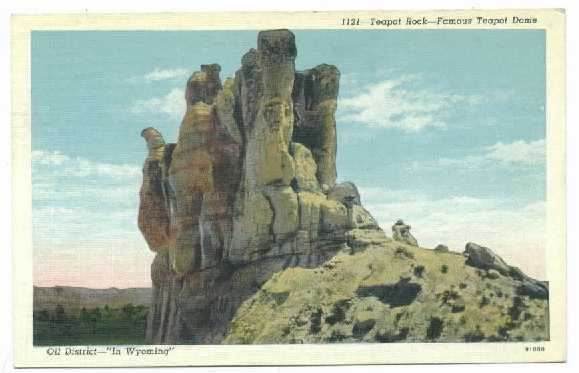 3, popularly known as "Teapot Dome," the underground formation which took its name from the above rock formation. The scandal, itself, then took its name from the dome. During the Spanish-American War the disadvantages of coal fired ships became apparent. A large ship could burn as much as 50 tons of coal a day and, thus, required frequent recoaling. Accordingly, the United States Navy looked to the conversion of the fleet to oil. In 1909, the USS Cheyenne, formerly the USS Wyoming (see USS Wyoming), was converted from coal to oil, marking the beginning of the conversion. In 1912, the oil fired USS Nevada and USS Oklahoma were laid down. At the same time across the Atlantic, under the urgings of First Sea Lord, Sir John "Jacky" Fisher, and Admiral John Jellicoe, the First Lord of the Admiralty, Winston Churchill, was rapidly converting the Royal Navy to oil. Thus, there came a need by the major naval powers to secure reliable sources of oil for naval use. Churchill secured sources for the British Empire in Persia (present day Iran) and in the Arabian Peninsula. The German Imperial Navy looked to Rumania. In 1912 and 1915, Presidents Taft and later Wilson directed that certain oil and gas bearing lands in California and Wyoming be set aside for the exclusive use of the Navy. Petroleum Reserve No. 3, Depot Dome, was one of these. The setting aside of important naval stores was nothing new. During the reign of Queen Ann, as an example, the Crown reserved in parts of New York timber rights in order to secure masts for the Royal Navy. Live Oak reserves for much the same purpose were set aside later in Florida to secure necessary oak for the U. S. Navy. 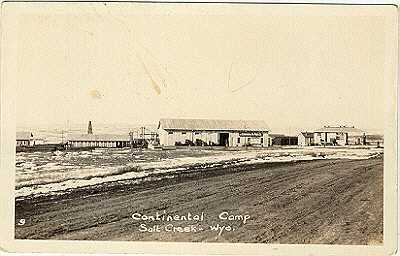 Continental Camp was located in Johnson County and is now known as "Sussex Unit." In 1920, Congress authorized the leasing of public lands containing oil and other minerals. In May, 1921, President Harding, at the urging of Secretary of the Interior Albert B. Fall, transferred responsiblility for the administration of the Navy Reserves to the Department of the Interior. Fall argued that he and his department were better qualified to administer the reserves. In 1922, Wyoming oil interests complained to, among others, Wyoming Senator John Kendrick that leases had been entered into with the Mammoth Oil Company, headed by Harry F. Sinclair (1876-1956), without competitive bidding. The lid blew off the teapot, so to speak, when a front page article appeared in the April 14, 1922 Wall Street Journal disclosing that Teapot Dome had in fact been leased to Sinclair. 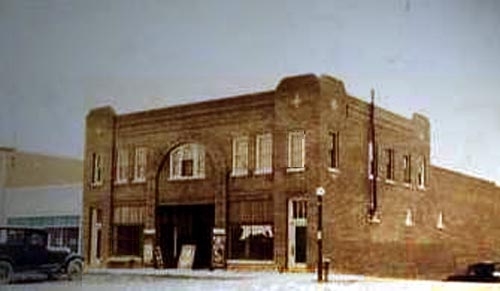 Sinclair was originally going to be a pharmacist, but in 1901 went into the oil business. With Edward White he formed first the Sinclair and White Oil Company and in 1916, the Sinclair Oil and Refining Corpration and the Sinclair Gulf Corporation which were merged in 1916. The Sinclair Dinosaur trademark was as a result of Sinclair's sponsorship of dinosaur excavations in Wyoming. 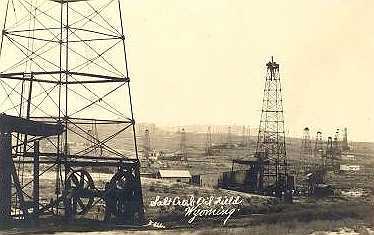 Congressional investigation revealed that in 1922, California reserves had been leased to the Pan-American Petroleum and Transport Company owned by Edward L. Doheny, under which Doheny's company was to build storage tanks filled with oil in Pear Harbor, build a refinery and build a pipeline to the refinery from the reserves. Doheny's estimated profits from the transaction was $100,000,000. The previous November Doheny's son presented $100,000 in cash in a black bag, ostensibly a "loan," to Fall. Q. When you got to Mr. Sinclair's private car, what if anything, did Mr. Sinclair give you? A. He gave me a package of bonds. Q. A package of bonds? Q. What kind of bonds? A. They were three and one half percent Liberty Bonds. Q. Were they counted there in your presence, in his car? Q. Did you open them? Q. Where did you take them? A. I took them to the Wardman Park Hotel. Q. To whom did you deliver them? In addition the $198,000 in bonds, Sinclair made a "loan" to Fall of $36,000 in cash. Everart, in turn, gave Sinclair Fall's check for $1100 ostensibly to pay for the heifers, bull, swine, and horse. As a result of the investigation, Fall was charged with bribery, Doheny and Fall of conspiracy to defraud, and Sinclair and Fall with conspiracy to defraud. Fall was convicted of the bribery charge and sentenced to a year in the New Mexico State Penitentiary. Fall was originally a Democrat but switched parties prior to New Mexico becoming a state. In New Mexico, Fall was suspected of corruption involving his defense of rustlers and the defense of Wayne Brazel, the confessed killer of Pat Garrett. Fall secured a "not guilty" verdict for Brazel. The prosecution by a personal friend of Fall could best be described as dissolutory. Garrett had been shot in the back while relieving himself. The defense was self defense. The prosecution failed to introduce the evidence that Garrett was relieving himself and had his back to Brazel. Indeed, it has been speculated that Fall was involved in a conspiracy to murder Garrett and had acted as the "bagman." Fall was also believed to have been involved in the earlier 1896 mysterious disappearance of Albert Fountain, a political opponent of Fall. Fountain and his eight-year old son were believed murdered. Their bodies, however, have never been found. The Fountain disappearance was apparently an outgrowth of Fountain's vigorous prosecution of rustlers whom Fall would defend. In a separate trial on the other charges Doheny and Fall were found not guilty with the jury allegedly breaking out into song following delivery of the verdict. The trial of Sinclair and Fall ended in a mistrial when it was revealed that Sinclair had employed a private detective agency to tail the jurors. Sinclair was charged with contempt of court and was sentenced to six months. Additionally, Sinclair had provided some 175,000 words of testimony before twelve Congressionional committees. In yet one more appearance, after charges had been brought against him, he declined upon advice of counsel, without invoking the Fifth Amendment, to answer further questions, on the basis that the matter was now one entrusted to the judiciary and the Congressional committee lacked jurisdiction. Sinclair was charged and convicted of Contempt of Congress. He was sentenced concurrently with the contempt of court charge and served his term in the Washington, D. C. House of Corrections. A civil action was brought in the the United States District Court for the District of Wyoming to invalidate the lease. The District Court determined that the lease was valid. The determination was reversed on appeal. Additionally, Sinclair lost money in Teapot Dome and returned to Sinclair Consolidated Oil Corporation its investments in the Reserve.